Not the most creative headline, but it is brief and straight to the point — and that’s what I’ll try to be in this post. First, I want to thank everyone for their support and prayers. It has been a very long day of wind and very little rain here on Long Island. With each passing hour, the gusts have grown stronger. Each time, we hear the house creaking and the sound of debris hitting the windows. But when it comes to hurricanes, location is everything. Fortunately, Joe and I live in the center of Long Island, so we did not have to worry about flooding. Our thoughts and prayers are with those who live along the coasts of Long Island, as well as those who live in the various shore communities along the East Coast, all of whom are battling the storm surge. We also have not lost power — yet — but the lights have flickered. In terms of damage, the top of a Blue Spruce that Joe’s grandmother planted in 1966 snapped off and is now lying in the courtyard outside of the living room window. Our neighbor’s Blue Spruce came out of the ground completely and is resting next to my arbor and on top of a row of hydrangeas. So far we have been very fortunate — and we are both eagerly waiting for daylight so we can get a better sense of what happened. ← And The Beautiful Blogger Award Goes To . . . Thanks. It’s been a long day — and I can’t wait for the daylight. I’l keep you all posted. Thanks for the update. These weather events keep me on edge no matter how far they may be from me. Glad to hear you and Joe are doing ok! Hi Mario! So far, so good. It’s been a wild couple of days. The coastal communities are taking the brunt — we’ve only had to deal with the wind, but not the storm surge. I’ll be in touch. Hi Kat. Fortunately, we’re not dealing with the storm surge and flooding — but the wind and sounds of things banging against the house does get to be a bit much. I’ll keep you posted as soon as I can. Thanks! Well the news is quite sad for downtown NYC. Glad you are OK. When you move to FL, you will have the seasonal hurricane threats every year. Hi Robert. The hurricane is one thing — it’s the aftermath that tries peoples’ patience that’s the real storm. I’ll keep you posted. Hi K. Yes, we’re okay — and I hope you are, too. I’ve spoken to A. and she’s okay. It’s so good to hear from you and have an update. I have been listening to WNYC all day today and occasionally checking in to CNN for pictures! I was with friends tonight and our consensus was that no matter what we hear or see, it’s just impossible to really fathom the power of the storm and the damage. We just continue to think of you with real concern. You have a great attitude. Resilience! Hi Debra — Like you, I am stunned when I see some of the images. In my immediate area, power outages are the real story. Just a few miles away, it’s power and flooding. Very sad. Hi Thea. Sandy looks to be a storm that just won’t go away. The center of the low is still spinning on the Pennsylvania and New York border — incredible! Hope your daughters are safe. Glad to hear that you are ok, take care now Best Wishes Karen. Hi Karen. Thanks for the well wishes. We’re in a lot better shape than so many other people — and for that we’re thankful. Thanks for the update. Listening to that wind all night is torture. Thoughts and prayers are with you:). Hi Elaine. Your thoughts and prayers must have worked — we survived relatively unscathed. I’m glad you’re out of reach of the storm surge – that’s what does the bulk of the damage. We lived on the Gulf Coast of Florida for about ten years between ’98 and ’08 and I know what it’s like sitting in the house with boarded-up windows and no lights (except candles) and hearing the wind roaring. Take care. And stay away from the windows! One careless neighbor’s lawn chair can be lethal in that kind of wind! Hi Ann. Thanks for the advice. I spoke to a friend who lives on the water and as she says, the storm surge is nothing like she’s ever seen. In a matter of two minutes, the surge was like a rushing river flowing through her community. We didn’t loose power yet…either! Stay safe. You and Joe, the gardens and others in the worst hit areas are in our thoughts and prayers. Hope you are safe. We survived and are doing well. Our thoughts and prayers are with those who have been deeply impacted by the storm. Hoping for the best for you. Hope you made it through the storm unscathed and that the surge was not more than you expected. Hi Joylene. We did very well in my community. Since we’re not on the water, the surge was never an issue. Just wind. Fortunately, the power stayed on, but most of Long Island is still in the dark. 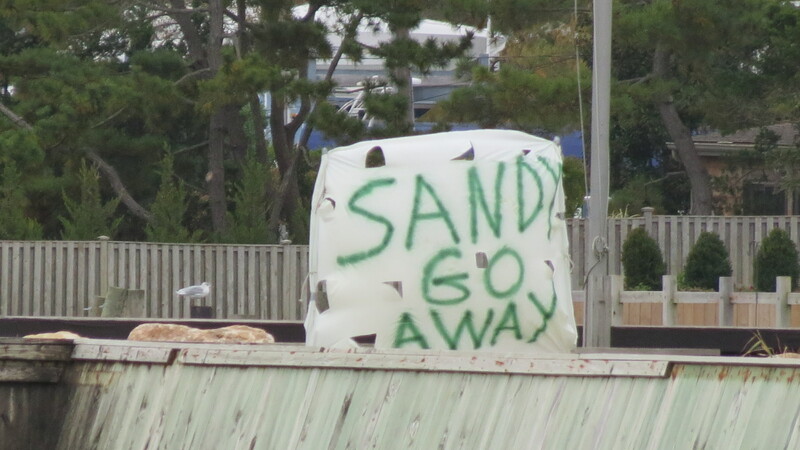 Yes, it looks really bad for a lot of people – glad you were able to escape the worst of Sandy’s fury! Hi Joylene. We were very fortunate — and for that, we are incredibly thankful. Hi Cathyann. I know as a native New Yorker, you must be glued to your television, watching some of the images. Hope your families and friends are safe. When I saw that Sandy had shifted and blasted NY I was worried about you! I’m so glad you’re ok!! The reason NY was hit hard was because of the direction of the storm. NJ received the hurricane force winds, but the tropical force winds played games with the water. My next post will explain that one. Good to hear that you are okay.. I was sitting there last night watching the TV and wondering about you… It looked like a real OZ evening. Over here in Holland Michigan we had some strong winds and yet we got just the outside of the storm… It has to hurt to lose grandma’s special tree…yet….thankfully it was just a tree!. My thoughts and well wishes are with you both. So glad to hear you’re okay. That can be a long night of waiting and wondering, when the wind is so strong. Thanks for the update! Cindy — thanks for the well wishes. Like I said, when it comes to hurricanes, it’s location, location, location. We did well, but communities just a few miles away, are still dealing with flood waters. Stay safe my friend and I hope it does not do any damage in your ares. It is just terrible to see it all on the news and I am glad you are both safe. We got our first snow this morning because of Sandy. Ugh! LOL! Take care. Hi Lona. Imagine the scope of this storm. Wind, rain, and surge on one end and record snowfall on the other. Kind of makes you feel small, doesn’t it? Glad to hear you’re well. Hang in there, that can be a long night to sit through and so much harder when you can’t see what’s going on. Glad you are okay! The pictures we’ve been seeing on the news have been crazy! Hello. We are fine — power and minimal damage. A few miles away, people have not been so fortunate.